Spencer Cannold is an NFLPA Certified Contract Advisor with JL Sports. Spencer builds his relationship with his clients based on honesty, trust, and dedication. These three principles are essential in order to ensure long-term success for each client, in the ever-competitive NFL representation business. As a competitor his whole life, he brings a great work ethic and network of contacts, which enables him to place clients in the best possible position to succeed. After attending Syracuse University, he completed an accelerated MBA program, in which he finished in just over one year. Coupled with his industry experience and interpersonal communication skills, Spencer’s business background in management allows him to service JL Sports’ clients to the highest level in all aspects of representation. He is involved in all aspects of client representation, focusing primarily on recruitment, talent evaluation, pre-draft preparation and rookie and veteran contract negotiations. Follow Spencer on Twitter. 1) What motivated you to work in the sports agency business, and how did that process start? People at Syracuse kept telling me, ‘You’re very hospitable. This might be something you could be good at’. Then, I started thinking what my skill-set was and that’s when I started the process. I started interning with XAM Sports in Wisconsin, I took the exam, and started meeting people. I went down to the Senior Bowl and met Joe Linta, the President of JL Sports. We started talking and had a lot of the same views on the business and everything. It really took off from there. 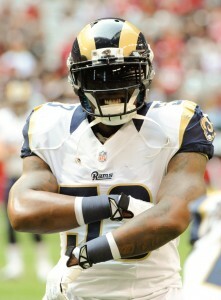 2) How did you conduct your first contract negotiation with client Daren Bates of the St. Louis Rams? 3) You obtained your MBA prior to taking the NFL certification exam. How much has that degree helped in your work as a sports agent? There were a couple contracts classes that have been helpful. …To be completely honest, I’ve learned a lot more working for the company than I did in the classroom. They are not going to teach you how to recruit a player in the classroom — you have to learn from experience. The experiences outside of the classroom are far more valuable. I think a lot of people think being an agent is really glamorous. People think it’s a lot like how the movies portray the business is. I really encourage people who want to work in this industry to do their due diligence and figure out what it is all about. 4) Mentorship is incredibly important and arguably necessary to work in sports. Has there been any one person or few people who have mentored you throughout your career? As a follow-up, what knowledge have they instilled in you. Definitely Joe Linta. The biggest thing that he taught me is you have to be real and up front with these guys. One thing that separates him and myself is that we’re honest and real with these kids. We’re not sitting there telling them that you’re going to be the No. 1 pick in the draft. …At the Senior Bowl, we’re not the guys sitting there hugging and kissing them and telling them how great they are. We’ll say, ‘Hey, you did a good job, but you still need to improve your footwork or whatever the case may be’. That’s just us. …We’re not for everyone. You have to have thick skin to work with us. That’s just how we are. If you want to be told that you’re the best, then you’re probably not for us. We’re going to help you and you’re not always going to like what we have to say. At the end of the day, we have your best interest. 5) Early in your career, was there ever a point when you thought that working in the agency business was not going to happen, and you should look elsewhere for a job in sports? If yes, how did you combat that feeling? Yes, absolutely. This business is extremely competitive and there are numerous barriers to entry. You don’t go on Monster.com and look for a job as a sports agent. It was tough to even get an internship at XAM Sports. People just kept telling me, ’You’re going to intern for a year or two.’ There are a lot of costs with agent dues and getting registered in different states. The costs of training players and getting players prepared for the Combine and their Pro Day. This was something that I’ve always wanted and something I’ve always been driven to. My desire and motivation to succeed in this business outweighed everything. 6) In 100 words or less, what advice would you give aspiring sports business professionals who want to work at an agency like JL Sports? The first thing is you need to do your due diligence and find out what an agent really does as opposed to what you think they might do. You really have to want it, because if not, there are going to people who want it more than you. How Will Black Friday Affect Poker Agents?